The Virgin is the stainless lily, which begot a rose that fadeth not, even Christ. O Holy Mother of God! Ewe without blemish, who bore Christ the Lamb incarnate of thee! O Virgin most holy, who brought the very armies of the Angels to astonishment! Wondrous is the marvel in heaven, a woman clothed with the sun, bearing the Light in her arms; wondrous is the marvel in heaven, the Virgin’s chamber that holdeth the Son of God; wondrous is the marvel in heaven, the Lord of the Angels is become the Virgin’s child. 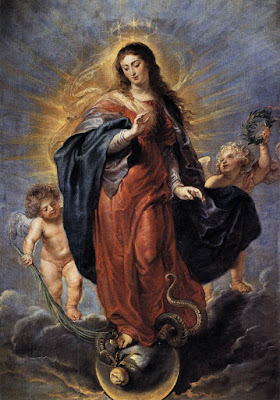 The Angels accused Eve, but now they attend Mary in glory, who raised fallen Eve, and brought Adam, who was banished from Paradise, into heaven. For She is the bridge between heaven and earth, who by Her childbirth brought about their union. Our good friends of the Schola Sainte Cécile recommend this lovely Mass composed in honor of the Virgin Mary, the Missa Ave Virgo Sanctissima by Géry de Ghersem (1573-1630).